The mild steel operator interface control enclosure, OICE, has a pre-machined hole pattern to allow for the fixation to a swing arm, plus a removable front plate at an IP 55 protection degree. Components can be easily fitted thanks to the removable front plate, but will also be easily accessible through a rear door. Side handles on the enclosure allow for easy movement of the enclosure into the working position. Body and door are manufactured from 1.2 mm mild steel, front cover and handles manufactured from aluminium. Folded and seam welded, with maximum opening. The front fitted with an aluminium front panel. Handling grips mounted to front, left and right edges. Surface mounted, with 130° opening. Concealed removable hinges, with captive pin. Hinges can be mounted to allow left or right hand opening. Door profiles MMDP are available as an accessory. Customised lock, with double grip for easy opening of the door. Double-bit 3 mm insert and 90° movement. Other inserts and locks are available as an accessory. IP 55 | IK 10. RAL 7035 structured powder coating. Top bottom profile RAL7016. Enclosure with aluminium front panel, rear door, plastic double-bit 3 mm key and mounting accessories. Mild steel operator interface control enclosure, with a pre-machined hole pattern to mount onto a swing arm system, removable aluminium front plate and a IP 55 protection degree. Components can be installed easily because of the removable front panel and accessible because of the rear door. The enclosure's pre-machined cut-out allows the panel to be quickly mounted to the swing arm system in the field. The pre-mounted enclosure side handles allow customers to manipulate the enclosure easily when performing operations. The enclosure reduces customer's labour cost and allows ergonomic use in the field, due to the pre-installed handles. The pre-machined cut-outs are suitable for both light and medium swing arm systems. 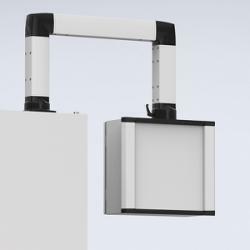 DIN rails (BDR) mounted together with profiles (BPP), or a mounting plate (BMP) can be fitted to the sides of the enclosure.